Stoke Travel offer all-inclusive camping, hotels and bus trips for Spain’s biggest festivals including La Tomatina. 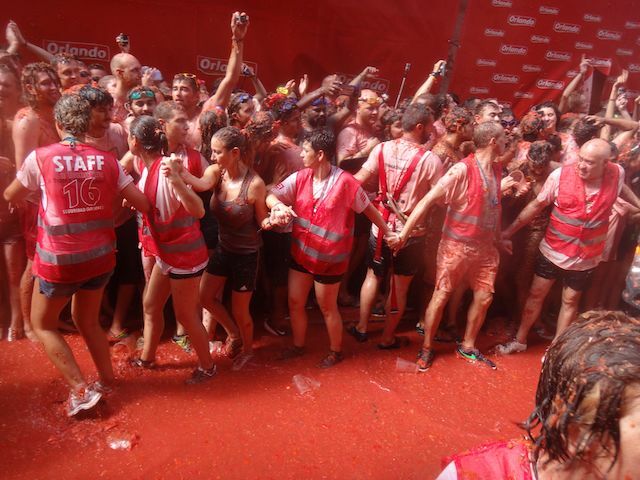 Book a trip to La Tomatina in August 2019 and get freebies like unlimited beer and sangria. Just add the word “FIESTAS” on the booking form. The origins of La Tomatina aren’t clear with several theories explaining how Bunyol has become home to the world’s biggest tomato fight. However, the most plausible suggests that the most likely explanation dates back to 1945 when an annual parade of enormous figures with big heads (Gigantes y Cabezudos) was passing through the streets of Bunyol. It seems that some youngsters tried to join in the parade and accidentally knocked over one of the giants who got to his feet and started swinging out at everyone around him. In retaliation the youngsters grabbed some tomatoes from a nearby vegetable stall and started throwing them at him until the police arrived to break things up. The following year on the same last Wednesday of August these young people returned to the town hall square and started another tomato fight using their own tomatoes. 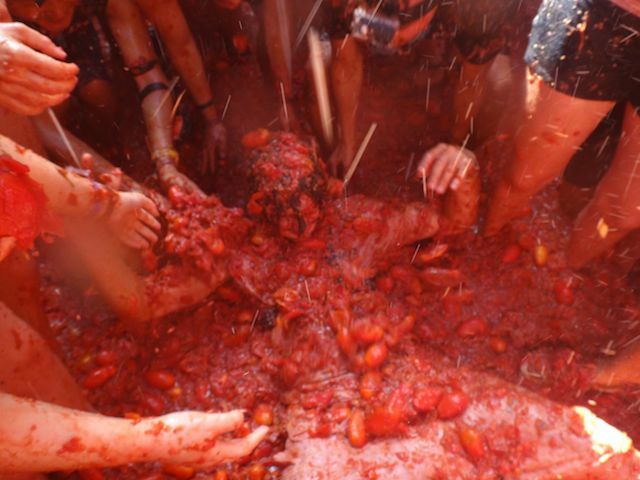 Again the police intervened and in subsequent years the local council tried to ban the ‘El Día de la Tomatina’ but with little success as the event continued to grow year after year reaching the ludicrous size it is today. Getting There … Most young visitors book cheap accommodation in Valencia then take the train to Bunyol for the day. On the morning of the festival there are trains from Valencia Central Station, which is about 40km away, at eight minutes past the hour (check at www.renfe.es just in case this has changed). There is no need to book tickets in advance and the journey takes 50 minutes. 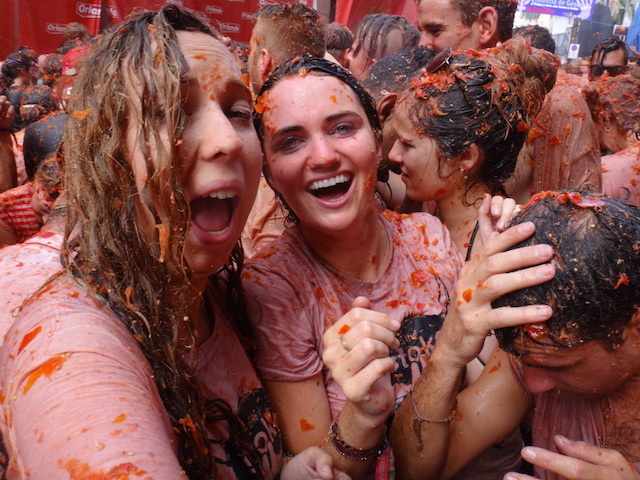 The actual tomato fight lasts little over an hour beginning at midday and continuing until shortly after 1pm. So the 8.08am, 9.08am or 10.08 trains will get you there in plenty time. The earlier the better as the trains do get full. Alternatively, you can arrive by local bus or rent a car though this might not be a great idea considering the mess you’re likely to be in after the tomato battle. Accommodation … Bunyol is a small village of some 9000 people whose population swells to some 30,000 on the day of La Tomatina. The Hotel Condes de Buñol is a nice little hotel in the town centre but there is hardly any accommodation in the immediate area so most budget visitors stay in a budget hostel or hotel in Valencia but you’ll need to book well in advance. 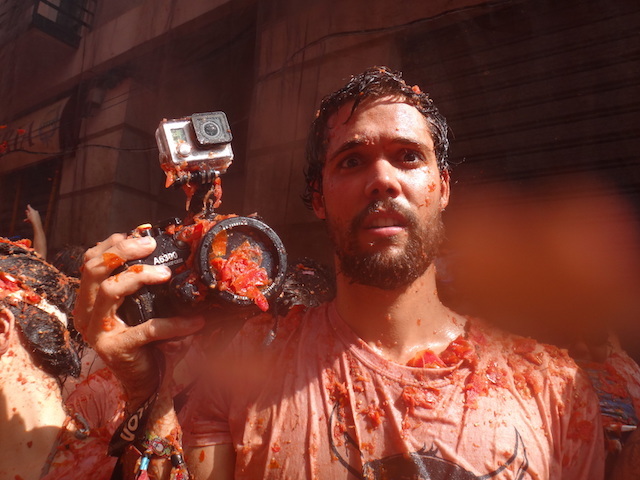 A popular option amongst young people is to book a Tomatina package with Stoke Travel. This travel agency based in Barcelona are specialists in party tours which include camping or hotel accommodation at the Tomatina festival. Another option is to head for the small family-run campsite called La Granjita in Chiva which is only 10km north-east of Bunyol. The owners provide you with the tent, bed, sheets, towels as well as breakfast and an evening meal if you want it. It also has a small pool which is so inviting once you get back from the fiesta. What to Wear … Whatever you wear is going to get destroyed so make sure you take a change of clothes for the return train journey. We actually found that a snorkel and mask were well worth taking! Afterwards you can try to clean up a little at the public showers near the river but these are generally packed. Until a few years ago the numbers visiting the Tomatina festival were large but manageable. However, in recent times the event has become a victim of its own success with upwards of 50,000 people trying to cram themselves into this small Valencian town which has inevitably caused security concerns. As a result the town council of Bunyol have been forced to limit numbers by issuing tickets to those wishing to take part. Tickets cost €10 each and can be reserved and printed out on the Bunyol Town Council website. Alternatively, you can book an organised tour to La Tomatina with numerous companies who will include tickets in their package. If you need accommodation for La Tomatina, Stoke Travel have all-inclusive camping, and they took us to and from the tomato fight. And they were ridiculously good fun. 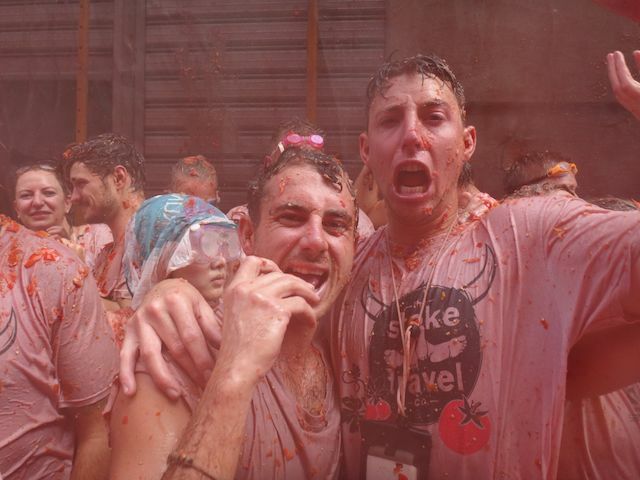 Has anyone ever gone to La Tomatina camping with Stoke Travel? I’ve heard they have all meals included, tickets to the fight and unlimited beer and sangria at the campsite! I would love to be a part of an annual food fight! That would be so cool!